On Thursday, shuttle bus operator Chariot announced that it would cease all operations by March. 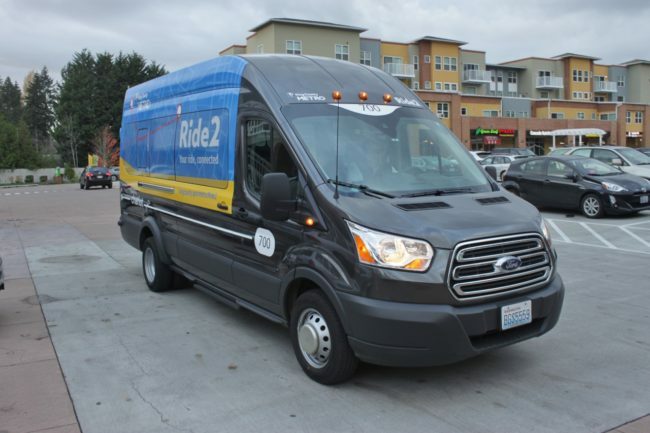 The company has a contract to operate King County Metro’s pilot “Ride2” microtransit service around the Eastgate Park and Ride, which hoped to shuttle suburban residents and visitors to and from the park-and-ride without relying on the existing, meandering bus routes. Chariot, one of several startups that aimed to reinvent “mobility”, was acquired by Ford two years ago and had partnered with transit agencies in Austin, Los Angeles, New York, and its native San Francisco. They also operate private shuttles for large companies, including a small fleet in Seattle. While the shutdown might not affect a huge number of people—about 100 daily riders requested rides in its first months—the idea of a more effective suburban transit option will nonetheless persist. Metro has contracted Hopelink, the operator of West Seattle’s Ride2, to assume operations on February 25. Eastgate riders will have to download the separate West Seattle app, which will handle all Ride2 shuttles once a new update is pushed to phones. According to Metro, the Eastgate Ride2 currently has an average wait time of about 9 minutes and an average travel time of about 14 minutes. These figures are not expected to change with the new operator, which uses a similar trip-deployment system. It turns out that paying a person to drive a van around all day, picking up passengers in ones and twos, isn’t a viable commercial proposition. Shocker… who knew? Well, it turns out driving a van around all day in a very limited area, and all required to begin or end at a certain location, is not commercially viable. I think having someone on the clock regardless of whether anyone was riding was part of the expensiveness, relative to “rideshare” companies. Uber, Lyft, and cab companies remain viable, and even have a few wheelchair-accessible vans. Their main complaint — not having access to HOV lanes unless carrying passengers (at least for the wheelchair-accessible vans) — has been the subject of legislation recently. While working for Hopelink comes with benefits, providing this service in partial competition with the rideshare and cab companies probably comes with a carbon footprint. But knowing that your driver works for a company that has a hiring process, knows where the driver lives, and has done a background check, just feels safer. Food for thought. But neither are a cost effective way to improve transit. Look, if you want to setup a cheap like Latin American model of public transit then you need Toyota trucks with welded bracing around the bed to brace yourself. A step ladder would be nice too. Otherwise use Uber, it doesn’t get any better. Not so sure about Uber either. The parent company hasn’t yet turned a profit, and most drivers are making due without full commercial insurance and not making enough to make a living after taxes and vehicle expenses (Part time to survive a “just-beyond-affordable” living situation or pay down a credit card is more likely). If Uber limited the number of drivers and/or increased rates and/or paid drivers for getting to/from pickups, maybe, but there are just too many “ants” waiting around to get pings nowadays. Of course, even at today’s loss-leader rates Uber is still too expensive for daily commuting. If Uber wasn’t awash in venture capital, it’d be dead too. Aye, but is it cheaper than $90,000 parking spaces? There are much better alternatives to both (e. g. cheaper parking spaces and better bus service). Routes 221, 226, 240, 241, 245, 246, and 271 serve Eastgate. I agree. Not only is it not cost effective, but isn’t especially effective for riders, either. Folks have an average 9 minute wait … to a bus stop. That is catching a bus that runs every 18 minutes, and then making a transfer. Not exactly speedy, and not exactly the long (or short) term solution to the problem. The time depends on how far you live from the bus stop. Average means that some are lower and some are higher, And if it’s using the mean instead of the median it can be distored by a few outliers. If we don’t have this, what other last-mile solution would be better? We can’t force everybody to live in apartments next to the bus stop, and we can’t even get the zoning to build the apartments. If we just say, “It’s your problem, ride a bike, get a ride, or pay $5 for a taxi”, people will continue driving., emitting carbon, demanding more lanes and parking spaces, which spreads everything out, and creates air pollution which affects everybody’s health. >> what other last-mile solution would be better? Satellite park and ride lots along with better traditional bus service. If this really is serving a lot of people, then it makes more sense to run a regular bus there. If it isn’t, then by definition it isn’t doing much good. That is the problem with micro-transit — it doesn’t scale. Anywhere. https://humantransit.org/2018/02/is-microtransit-a-sensible-transit-investment.html. Micro-transit doesn’t solve the last mile problem in a cost effective manner. It only makes sense as a means to serve those who do not drive, not as a means to reduce congestion, decrease air pollution, or reduce global warming. Chariot is just a bourgie version of a dollar van, something that has existed for decades in NYC. It can be a lifeline for neighborhoods that aren’t well served by transit. Chariot in contrast, mostly sent white collar workers to high paying jobs so they could avoid taking public transit with the proles. The “limited liability corporation” is history’s most shameful moral cop-out. Divine departure message to Adam and Eve: You kill somebody, their family comes to….and for…you and me. When we “privatize” something, what we’re really doing is paying somebody else to take the burden off of us. Whose own fully justifiable business plan is to keep the damn thing ’til something less burdensome comes up. And then unload it. Charging us a handsome fee for the privilege of getting our own life’s necessities dumped back in our own laps where they belong. I’ve heard arguments on both sides of that. On the one hand it allows officers to act recklessly and get off scot-free. On the other it makes publicly-traded companies possible. People wouldn’t invest in stocks if they could be bankrupted over liability for something they didn’t have anything to do with and didn’t know about.. I really hate saying this, but since these people have chosen to live in an ultra-sparse development, why can’t we just give them the same level of service that folks in other parts of King County (Auburn, Federal Way, Woodinville, North Bend, etc.) get. i.e. Figure it out yourself and take a cab, drive, or have a family member drop you off. Why do we subsidize service to this particular corner of the county with terrible land use, but not to other corners of the county with identical land use? Once again, we are subsidizing the wealthy in Bellevue. If they get Ride2, then my neighborhood should also get Ride2. The pilot program came about because parking spaces at the transit center are temporarily unavailable due to construction. If we get into a cycle of deploying and using similar services during long term projects (e.g. West Seattle right now), perhaps the opposition to new projects based on construction woes will fizzle out. You can’t lump Bellevue in with the same category as Auburn or North Bend. For starters, we’re talking about a 1-2 mile distance to the local transit hub, rather than 5-10 miles (or, in the case of North Bend, over 15 miles). It’s also much closer geographically to Seattle, so people are more likely to be willing to commute form there. Auburn and North Bend, yes, some people do commute all the way to DT Seattle from there, but it’s so far, there’s only so many people willing to do it. Service to the undeserving rich really gets me too, Engineer. Though we have to accept how our pervasive neoliberal (think Fred Flintstone with a “Joe Biden in 2020” bumper sticker) environment will always let them blackmail us with their threat to flood “Kiss & Ride” stops with Rolls Royce SUV’s equipped with a flamboyantly springy mattress behind the crimson plush curtains. So based on yesterday’s really fantastic video from the Philippines – she’d be a terrific streetcar instructor, wouldn’t she? !- we could require these spoiled ingrates to at least attach a trailer carrying an espresso machine to provide free morning coffee to their fellow waiting passengers. Come on, people really DO value coffee they don’t have to pay for provided it’s not Starbucks! I don’t mind having buses in Medina. If we didn’t have them, I’d have to drive to work everyday! I think we Medina residents pay the same taxes for Sound Transit and Metro as everyone else… I am just always surprised that my neighbors don’t realize what a godsend that Evergreen Point bus stop is for people in Medina. Much of the town lives close enough to walk there and be at UW’s Link Station in a few minutes. It opens up all of downtown Seattle no matter how bad I-5 is. As I wrote before, this is the wrong solution for Eastgate. There are areas where this kind of service makes sense — mainly as a way to serve the suburban/rural poor. I’m talking about folks who can’t afford to drive to a park and ride, yet live too far away from decent bus service. Much of the south Sound area is like this. But not Eastgate. The park and ride lots are full. Obviously then, people are willing to drive themselves to a convenient bus stop. The problem is that the buses mainly just serve the one main park and ride lot. The obvious solution is to build or expand satellite park and ride lots and run direct service from there to downtown Seattle. There are a couple of issues with this. One is that you can dilute the bus service. Instead of lots of buses running to Eastgate (say, every ten minutes) you have buses running every 15 minutes to Eastgate, and every half hour to other park and ride lots. Except that buses run very frequently to Eastgate, so it really doesn’t matter. The other issue is expense. Running buses to downtown costs money. However, that is likely a requirement anyway, assuming this actually worked. It is my understanding that buses serving Eastgate are crowded. That means that if this actually increased ridership substantially then you would need extra buses serving Eastgate. It really doesn’t matter whether the bus is serving Eastgate or some other park and ride (or street). I think this is just another example of Metro (and the region as a whole) being too timid when it comes to the current period. It is all too easy to come up with minor improvements that involve only a handful of riders, knowing that in a few years everything will change. Eventually East Link changes everything — so why mess with the schedules now when you will have to do it again in a few years. I think that is a big mistake. Furthermore, the foundation you lay now would work well in the future. For example, let’s say you run a bus from the Newport Covenant Church Park and Ride to downtown (https://goo.gl/maps/DF9Bom4j4qz). A bus like that would also have some walk-up riders along the way (there are apartments along that route). The park and ride lot might not be big enough, but investing in that park and ride (or similar ones) is likely a lot cheaper than making Eastgate Park and Ride bigger or running this shuttle program. There are several churches along that route that could be uses as park and ride lots as well. Once East Link gets here, the bus simply gets truncated at Mercer Island. If the park and ride lot isn’t big enough, then deal with it now (the problem isn’t suddenly going to get better once East Link gets here). The shuttle isn’t doing well to get people to Eastgate — it will be even worse as a way to get people to Mercer Island or South Bellevue. So… there isn’t just a question of P&R utilization, there’s also a question of bus utilization. And there’s a question of what kind of schedule can be supported by the service. If we really need extra buses into downtown Seattle at high-peak hours, then there’s no substitute for adding it. But that’s the most expensive thing to add to our system. If local connecting service is time-effective for riders and if the existing trunk expresses have the capacity then the local connectors can provide better frequency and span for the same money. – If we try expanding the minor P&Rs we’ll find that concentrated parking is, indeed, expensive, just as it is at the major P&Rs, and… spending lots of money per-space to build up a P&R that isn’t big enough to attract lots of riders and isn’t a significant transfer point is not going to be very cost-effective! I don’t see how they could. Look at the 212, for example. It runs every 6 minutes, peak direction. Metro isn’t going to run a peak direction bus every 6 minutes unless it is full. It will run it 10 minutes at most. Which means that if this really does lead to a huge increase in ridership, they would have to increase frequency on the bus. As always, increasing frequency is a good thing. But going from every 6 minutes to every 3 minutes is really not much an an improvement (especially since it isn’t the only bus going from Eastgate to downtown). Meanwhile, all of those new riders are having to wait an average of 9 minutes for the shuttle. The minor improvement in frequency is nothing compared to the extra waiting for the shuttle. Then you have the cost of the shuttle, which has to be extremely expensive per rider. In contrast, if you added bus routes like the one I proposed, then a lot of riders just do the initial work themselves. From a system standpoint, driving to a park and ride is really not that much different than someone walking to a bus stop. The bus saves an enormous amount of time — and thus Metro saves an enormous amount of money — by avoiding detours. Furthermore, it would mean buses running every six minutes along Factoria Boulevard, headed to downtown Seattle. Right now, people who live in that area (many of whom live in apartments) have to choose between this weird shuttle system, or taking a bus towards Eastgate, and then making a transfer. The transfer may be quick, but that really is the wrong direction. A direct bus to downtown would be much better. I’m not saying you would get anywhere near that frequency. You would probably do OK with every ten minutes. The point I’m making is that this is the wrong tool for the job. If this connected to a train, or as you said, a bus that wasn’t full, then it have merit. If it connected to the actual destination, it would as well. But a shuttle service to a bus that is crowded just doesn’t make sense to me, and seems more like a symbolic gesture than anything else. What bothers me most is that it seems like the type of symbolic gesture designed to placate those who don’t like or understand transit. It is a very automobile centric approach, and one bound to fail. Drivers initially attracted to the convenience of front door pickup will soon tire of the long wait, or long set of detours required for the ride. As with all point to point systems, it will prove extremely expensive per rider. It won’t lead to a long term improvements in the system, since it doesn’t scale, and doesn’t make sense when Link gets to the East Side. Who wants to take a shuttle to Eastgate, then take a bus to Mercer Island, then the train to Seattle? You could run the shuttles to Mercer Island, but that becomes extremely expensive or slow per rider. In contrast, additional routes into other easily accessible park and ride lots (via relatively densely populated corridors) could easily change the way people look at transit in the area. I always assumed the peak-onlly expresses had only a few people on them, based on my experience on some off-peak buses in those areas. But as I’ve ridden more of them over the years I’ve seen that they’re consistently full. I’ve never been on a peak-only route I could use, but I sometimes take them after work from downtown to somewhere and take a local bus back. I rode the 218 to the Issaquah Highlands P&R and it was full, and the surrounding buses to Eastgate were full. That has been my repeated experience on peak routes I occasionally ride or more often see. So there are busfuls of people wanting to travel, and doubtless more that would travel if there were more buses, or if they went to someplace other than downtown Seattle. However, we have to balance that against the cost of buses, other transit needs including making a car-free lifestyle practical in multifamily areas, the high cost of garages, the dead space taken by surface lots (although some like churches are there anyway), and the 50% productivity loss from deadheading back to the origin (compared to a route with two-way demand). I have long advocated a last-mile service to bring people to the nearest transit center. It’s the only way to get more people out of their cars in low-density areas, and to make transit available to those who don’t have cars and can’t afford a taxi (children, elderly, recovering after surgery, broken car). Most middle-class people can afford a taxi occasionally but not every day. Ride 2 is an experiment along those lines. The performance depends on the specific neighborhood, and matching the number of cars to the demand so that people don’t have to wait excessively. Remember that a bus would also have higher than zero travel time and wait time, so you can’t compare it to zero. Over time the operators will figure out the optimal size of service areas and number of cars. The first questions to ask are, why does it take 15 minutes? A drive from Somerset to Eastgate takes 5-10 minutes, and a drive from south-central Bellevue or Phantom Lake to Eastgate is closer to 5 minutes. So you would expect a 5-10 minute trip, maybe a 10-minue wait, and maybe detouring 5 minutes to pick up somebody else. These are not large service areas so I think the service can be made better. And places like Issaquah would also benefit from this, and even parts of Seattle like around Mt Baker, Ballard north of 85th, and parts of northeast Seattle and West Seattle. Ideally all of Seattle would have missing-middle density and mixed use like San Francisco and Vancouver to support a lot of crosstown grid routes, but it doesn’t and it’s difficult to get upzones through. So we either provide last-mile service or abandon those areas to cars. Abandoning them to cars causes voters to demand impractical solutions and resist transit taxes, which is how we got into this mess in the first place, and going further in it would make Pugetopolis a Silicon Valley hellhole. And has been repeatedly noted, private carshares are a luxury for the rich, not a complete substitute for last-mile transit. However, Jarrett Waker has recently made a strong point that even the least-productive fixed-route bus gets 10-15 riders/hour, while on-demand taxis get 0-3. So maybe we need to think a lot broader about coverage service, and get them into all the single-family arterials and running half-hourly, and that would be more cost-effective than on-demand vans. But we can still experiment with different models and see how they work in specific areas. The biggest problem is the lack of transit of any kind from many single-family areas, or that’s so limited it runs only a couple times a day and serves only trips in one direction. So we need something better than that, and we can be flexible about what solutions might work. So looking south of I-90, the 240 is really the only all-day route… the 111 and 114 cover different parts of it as a peak-hour shadow but both skip off to the freeway well before getting to the built-up area around Factoria. Factoria gets a frequency boost from the southern tail of the 245 but it’s an out-of-direction transfer for Factoria-downtown commuters. Meanwhile Factoria could be on the way for commuters up in the hills who have no all-day service or weird Eastgate connections, and it has a fair number of jobs in its own right. It’s probably true that “marginally better DART with an app” isn’t going to move the needle, so… maybe next time the Eastgate routes look due for more trips maybe instead those trips should be sent to the hills via Factoria, because that could move the needle? That sounds plausible. Service span would be limited, but a lot of people would have at least some Eastgate transfer as a backup if they missed the last bus out of Seattle. So… next time some Eastgate-downtown route looks due for more peak-hour trips, maybe consider sending those trips down by Factoria and on to somewhere without downtown service instead? OK, I’ll buy that. The “serve eastgate but with a mixture of routes with different tails” is already occurring. The 21X series and the 555/554 all have different tails, which means those routes collectively cover more route pairs while converging on Eastgate. The issue is the different tails all pretty much all east of Eastgate, generally splitting somewhere in Issaquah to serve various destinations north & south of 90. There still a service area that is missed out for people who are too far to walk to the freeway station but also not “on the way” of the various routes that converge onto I90. One additional point – Eastgate is a destination unto itself. Bellevue College is a robust trip generator, and there are plenty of office buildings nearby and in Factoria. So a service like Ride2 is intended to move people in both directions. I personally took Ride2 to a doctor’s appointment before heading into Seattle for work, and it was great in both directions. It’s a narrow use-case, but I can see what KCM is trying to do to serve a specific area that is hard to serve with linear bus routes. Finally, all of this is moot as long as parking is free. Only when the choices are paid parking or a free shuttle ride will the shuttle get reasonable ridership. As for “no one in Factoria wants to backtrack to Eastgate to get to Seattle,” I think that’s incorrect because it ignores traffic patterns. Trying to get off of I90 into Factoria can literally take 15 minutes during evening rush hour – I think it would be consistently faster to travel to Eastgate and take a shuttle to Factoria. The center lane freeway station at Eastgate is a massive speed & reliability asset for that whole corridor, so it makes sense that KCM is trying to leverage it, rather than send buses down the different exits. – A connection to a local coffee house. A Baristabus would be enticing for some people. – A childcare-on-the-way shuttle. Some parents would gladly pay extra for some sort of coordination with day care or schools. I’m sure innovative entrepreneurs could think of other possible gimmicks. The larger point is that time and effort for intermediate trips is a potentially valuable strategy. I really hate how so many suburban and even urban transit centers are single-function so that intermediate trips are not possible without walking at least a block or two. At least at the present, Uber’s Express Pool appears to be offering better service than Ride2, for a very cheap price. Just for fun, I pulled out my Uber app and asked for quotes from Eastgate P&R to a random house near Phantom Lake at 5 PM this afternoon, and again, at 7:30 PM. The quotes came in at $2.43 and $2.23, respectively, with projected wait times on the order of about 2 minutes. Yesterday morning, I rode Express Pool to Eastgate P&R, all the way from DT Kirkland, for about $15, including tip, without the promo. Granted, these figures included a 50% off promo, but even without the promo, it still means that, at the end of the day, the value of Ride2 over Uber is basically that the customer saves $5, in exchange for a few extra minutes of waiting. Prices this cheap almost make Ride2 feel almost like a solution in search of a problem. Granted, even these fares are still high enough where asking a low-income person to pay it twice a day, every day, could be a hardship. But, people that tight on money are probably not living within the Ride2 service area to begin with. All in all, I don’t think there is a one-sized fits all approach for last-mile suburban transit, rather, I think you need a little bit of a bunch of things. Feeder buses are important, but they should focus on putting more frequency on the higher-volume corridors, rather than spreading themselves thin, trying to serve every home. Satellite P&R lots at churches makes a lot of sense, and cost very little. Ideally, you would want some of the Seattle express buses to continue onward to some of the satellite lots, so the transfer penalty is avoided. Subsidies for UberPool/Lyft Line might make sense in some situations, but to keep the costs manageable, they would likely need to be restricted to low-income or disabled individuals. Parking at the P&R needs to be paid, so that driving and parking doesn’t look artificially cheap compared to alternatives. In many cases, improvements to the pedestrian infrastructure would also go a long way. Consider the neighborhood just south of Eastgate P&R, for example. If there was a cut-through staircase through the greenbelt, that took you straight to the 142nd St. overpass, some of the people that, today, drive and park, would walk instead, especially if P&R parking cost money (remember, to catch a bus to Seattle, you don’t have to walk all the way to the ground-level bus bays – the freeway station in the middle of I-90 is much closer, coming from the south, and good enough). But, in general, I feel that, at long as Lyft and Uber are continuing to serve the Eastgate area with cheap fares and short wait times, I don’t feel a compelling need for Metro to operate yet another shuttle that does essentially the same thing, with no better efficiency. Can I play devil’s advocate here for all those people that keep asking for fixed-route service instead of these vans. Don’t you think with the ridership data from these Vans they be able to tell where did the demand is coming from ? Don’t you think they would do some sort of cost-benefit analysis at that point , comparing the van service to installing a fixed route or a dart route ( flexible service area. ) ? And finally it’s a community services project, that means the city of Bellevue also put money into this. If you want more service in your particular City talk to your mayor for City council.